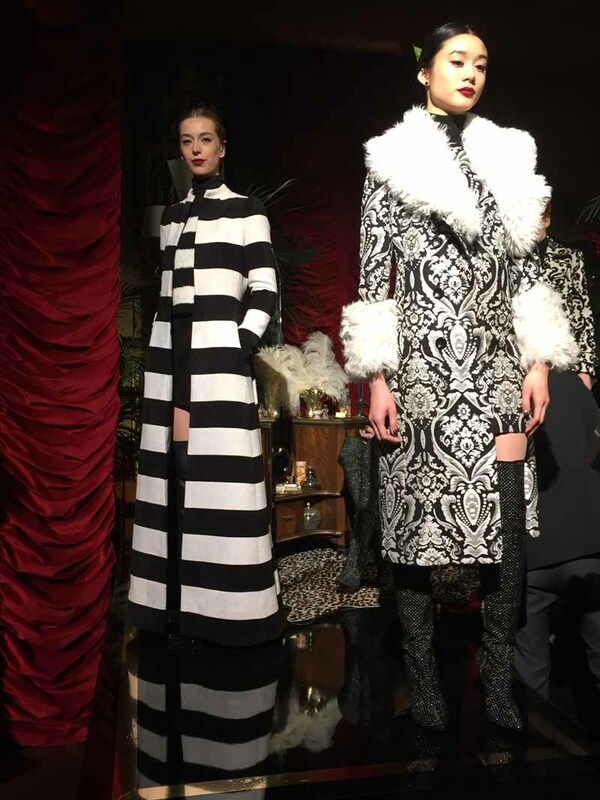 Stacey Bendet’s Fall 2015 collection for alice + olivia draws inspiration from the Biba enthused days of swinging London and the rock and roll era of the Rolling Stones, taking us back to the fashion and decor of the late 60’s and early 70’s. Texture is the new print this season. Long, flowing dresses are accented with lace details, floral jacquards are shown in mod shift shapes and graphic diamond designs are seen on wide-leg pants. The alice + olivia girl is interestingly layered this season with an emphasis on the winter short, often paired with long tops and matching jackets that are artfully styled at Bendet’s hand. The color palette for Fall is opulent and uses winter white, black, and camel to highlight rich jewel tones such as dark reds, blues, greens, and shades of merlot. Rich, textured fabrics are key, as Stacey re-imagines extravagant long coats and pants in regal jacquards. A lengthy brocade vest looks luxe in gold and blue jacquard with matching pants and a mock neck top—mock necks, especially in lace, are a key style for Fall. Mod miniskirts are paired with pea coats and thigh-high boots. Mongolian furs are shown over printed dresses while trench coats with fur and leather details are paired with graphic printed shorts. A black wide-leg tuxedo looks 70s chic paired with a silver embellished mock neck top. Embroidery, adornment, and beading are exquisite and in the finest detailing done to luxurious effects, but in a youthful way that is chic and wearable. “This season is about personal expression. It is about bold femininity. It is about glamour. The clothes have a true rock and roll vibe while being simultaneously very romantic,” says Bendet.